Harris & Ewing, photographer. (1930) Train tracks near Potomac River, Washington, D.C. District of Columbia United States Washington D.C. Washington D.C, 1930. [April] [Photograph] Retrieved from the Library of Congress, https://www.loc.gov/item/2016889645/. 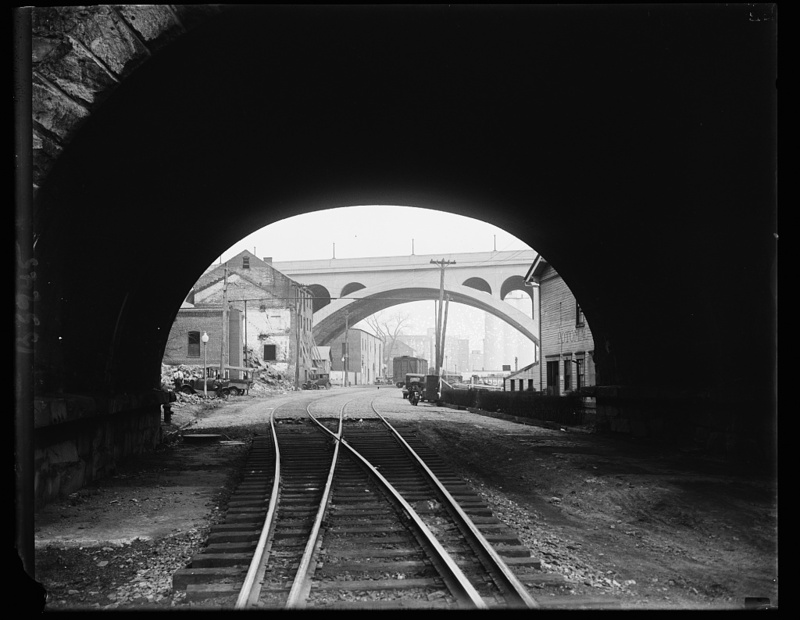 This view is facing geographic East, looking from beneath the Aqueduct Bridge down Water St along the tracks. Here, the switch opens up to dual trackage laid in the cobblestone streets of Georgetown. In the distance one can see old brick warehouses in disrepair; remnants of an era that was coming to a close. A wood sheathed box car sits alone to the right and various automobiles and motorcycles line the street. The Potomac Boat Club is just visible to the right, nicely done up with shrubberies out front. Through the haze in the background we can make out the Wilkins-Rogers Milling plant and the Lone Star Cement plant on the right. An arch of the Key Bridge dominates the scene. One interesting thing to note is the double-track “telltale” which spans the tracks just beyond the bridge. The little dangling “whiskers” were there to warn any railroad brakemen raiding atop the cars that the overhead structure (in this case, the Aqueduct) was approaching. There was a matching set on the other side, behind the photographer. Also of interest is the cobblestone street and the girder rail, used to ensure a flangeway in the shifting cobbles. In the early 1940s the road was paved with concrete and the flanges were cast as part of the right of way. Surprisingly, several structures remain today that are in this photo; the small brick building to the left, the Brenizer Brewery building straight ahead, the Key Br. (obviously), Wilkins-Rogers Milling (although altered), Potomac Boat House and the Aqueduct arch.